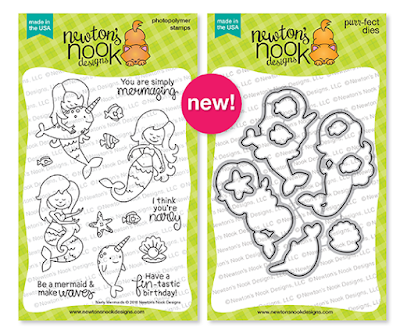 Hollybeary Creations : Newton's July Release and Celebration! Happy Monday everyone... it's time for the Newton's Nook July Release and this month it's a Celebration too!! Newton's Nook Designs is Celebrating 5 years and we have a Huge Release and Blog Hop on Friday to celebrate!! We have a Huge Release this week be sure to join us each day for a Sneak at what's coming Friday and leave a comment on each of the Design Team members blogs for a Chance to Win! 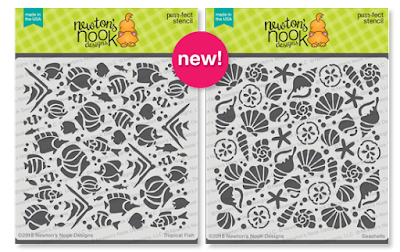 Let's get the sneaks started.... Today we are introducing Three new Stamp sets and Coordinating dies and Two new Stencils. My first project shares a look at the new Manatee-rific Stamp and coordinating die set. I also used the Waves Stencil from a previous release to add some texture to the background. 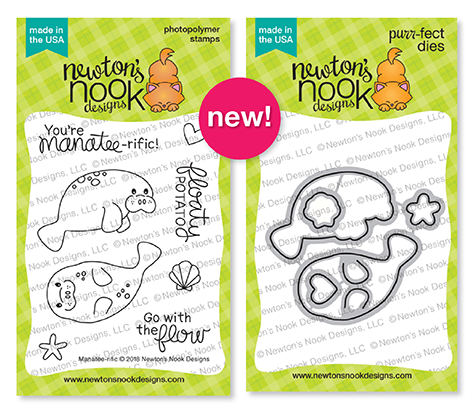 This set is unique as the die cuts the arms of the Manatee so it can hold something, like the heart. I created the background with some Distress Oxide Inks on watercolor paper and then I overlaid the stencil and used some Salty Ocean Distress Oxide ink. I trimmed a 1/4" off the sides and stamped the sentiment in Black ink. Then I added some Washi tape to the sides of a White card base and adhered the Main panel in the center with some foam tape. The Manatees are colored with Copics and I used the coordinating dies to cut them out. Up next is the super Cute Narly Mermaids Set and I also used the Seashells Stencil on my background with some Glitter Paste. I added some Distress ink to one side of a piece of Watercolor paper, once it was dry I added some Clear Glitter Paste from Nuvo with the Seashell stencil. I set the panel aside to dry. I colored the mermaid image in with Copic markers and then used the coordinating die to trim her out. I die cut a sentiment banner using the Frames and Flags die set and adhered it to the card front with some foam tape and I adhered the mermaid along the edge. 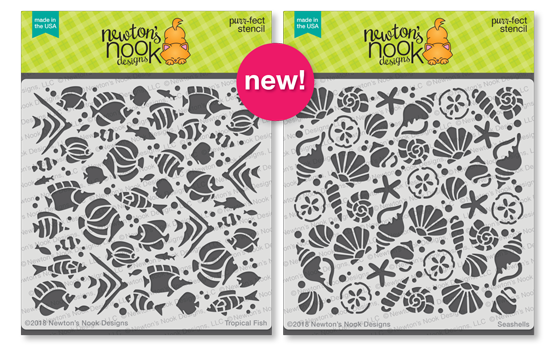 and our final sneak today is the Purr-Maid Newton stamp and coordinating die and the Tropical Fun Stencil. I added the stencil to the background with several rainbow shades of Distress Ink and then I stamped and colored the images with Copics. I used the coordinating dies to cut them out. I adhered them with foam tape around the sentiment that I stamped directly onto the card. I wanted a little extra sparkle so I added some Sparkling Clear Sequins. Your cards are so adorable. Love the mermaid stamp. Such fun cards...love the rainbow inked up stencil on the last. Oh wow! Loving your projects with these fabulous new products! Super sweet and fun cards! 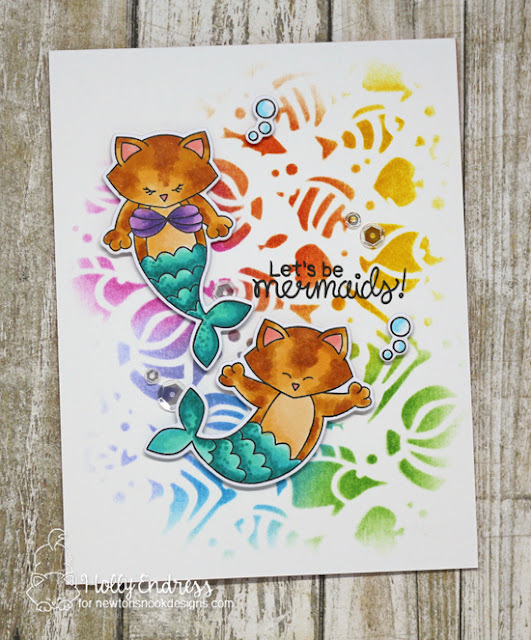 Beautiful coloring and I love the bit of sparkle on the mermaid card. I love the stencils used in the background! I'm loving your terrific backgrounds for each of these wonderful new sets! Big Congrats to NND on 5 furbulous years! wow those are amazing cards! but I will admit my favorite are kitty mermaids! Love your gorgeous cards, especially the "Purr-maids". So much fun. Wonderful cards! I love your backgrounds! What beautiful cards! Love the way you colored the manatees! So cute! These cards are awesome! 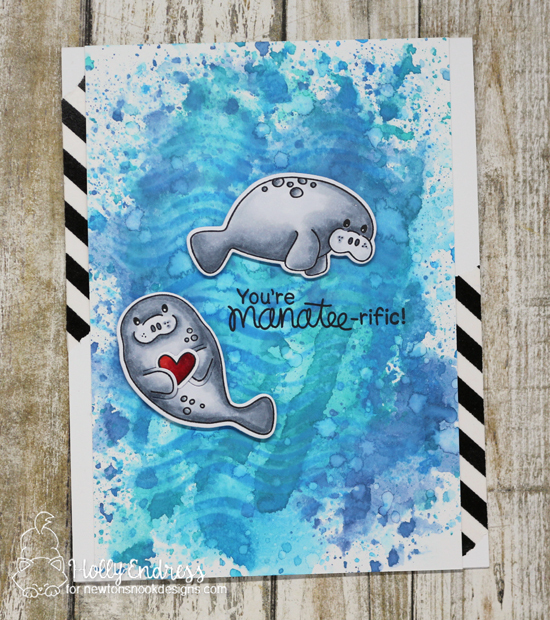 Love the backgrounds & the coloring especially the cute manatees! I love the blond mermaid! The hair the design... beautiful! Cute cards!Thanks for the chance to win and sharing. So cute!! Love the backgrounds you created. This is such a great release. Love your backgrounds! The rainbow fish stencil is awesome! Your cards are adorable ! Your manatees are really cute. Beautiful cards. I am just amazed at your watercolor backgrounds. Such lovely cards, I love your backgrounds so much! 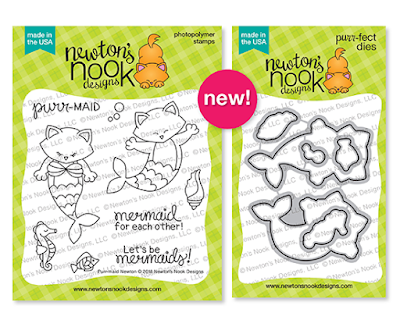 These mermaids, purrmaids, and ocean creatures are so cute! Beautiful cards! GORGEOUS, GORGEOUS, GORGEOUS cards! I absolutely LOVE the water color backgrounds for each of these cards! Just soooo much fun going on with each of them!! love the watercolor background and the multicolor stencil! the merkitties are adorable! Cute and colorful--love the backgrounds. Great cards, love anything with a sea theme! Those manatees are so cute! :) Great cards! You’ve made such a great trio ! I love the possibility to put something in the manatee’s arm, so cute !